ADHD is one of the most researched yet least understood conditions of our time. Living Beyond ADHD host, Dr B, is here to explore relevant information that just isn't making it from the experts to the general public, and to close that gap. Those diagnoses missed in earlier years and made in adulthood, add many burdens to the discovery. Failed marriages, bankruptcy, unemployment, academic failure, underachieving, depression, anxiety, low self-esteem, and a deep mistrust of self, are just the tip of the iceberg. In order to live a happier, more productive and successful adult life in today’s world, you must learn the essential executive function skills and strategies. Those missing skills and strategies rather than just your ADHD could be what are driving your greatest challenges. 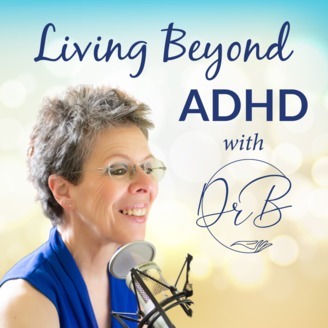 Living Beyond ADHD, a podcast hosted and produced by Dr B, explores why so many adults with ADHD or Executive Function challenges never get past their challenges and live beyond them. That’s what Dr B's work in the world is really about, and she so wants that for you, if you want that too. You’ve heard her say many times that you are more than your ADHD; that you are a precious “human being” – even if the “human doing” part of you needs some work and tools. By identifying the root cause issues, and addressing them, whether that means learning skills, strategies or facing and resolving long-standing problems, you can look to a future where you too are Living Beyond ADHD. Help me in my mission to make sure that all adults with focus, follow through, self-management or executive function challenges have the information and skills to help them live a happier, more productive and wildly successful life - please share with your friends and family. Download the mp3 audio file and listen whenever you like. Download the episode transcript to follow along if that's important for you. Click the link to put your information in the FORM on my ADDventures in Achievement page, and I'll contact you within 24-48 hours (except during my Sabbath time of Friday 2:30 pm PT - Sunday 9 am PT) to chat about your needs and my programs. The Living Beyond ADHD Community on Facebook where I'm around to help you as a community member; reach out to me with a friend request, answer the 3 questions posed for group members, and I'll welcome you into the community group.